It's the rocket that chews on me! In his first (and only) animutation, Aaron Ackerson brings us the touching story of Chew Chew Rocket, a rocket that likes to chew on people and things. guy who was also in Untitled? two sets of dancing people? 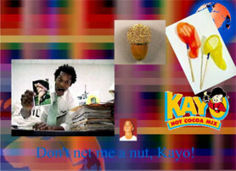 Don't net me a nut, Kayo! The neck, oh Wakko, why? The "Salsa For Dummies" book is a reference to The Leonard Nimoy Should Eat More Salsa Foundation. Hyakugojyuuichi: The message "Found a hobo in my room" appears at one point. The Japanese Pokerap: A talking T-rex asks the 7-Up Guy "How's your mouth rolling today?" The last fake lyrics actually say "Turn The Lights Down Low" and "I Believe The Robots Are Our Future" backwards. This page was last modified on 10 October 2016, at 09:06.